Don't laugh now... those big body pillows that everyone swears by... well, we promise that you're going to be part of the crowd if you try it too! As you and your Belly get larger, it becomes harder and harder to get restful sleep (don't you know it?). Well, we took the word of many a pregnant woman and tried a full-length body pillow - why not we said at this point? Well, whether you're in bed or on the couch, a body pillow is perfect for snuggling. Because it conforms to your body positions, it's very helpful for expectant mothers, especially since that body is growing in many directions. 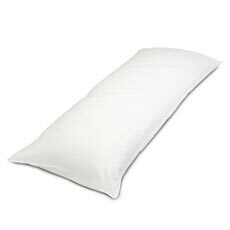 Overfilled with hypo-allergenic polyester fiberfill and measuring 20" x 54', the Bodymate Body Pillow is where it's at! It's 50% cotton/50% polyester and machine washable, and ... it's only $9.95 at your local Bed, Bath and Beyond store. Try it out - we're never giving ours up!